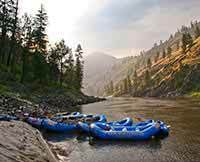 Our Salmon River Trip was amazing. Our trip leader Matt was awesome - the other guides were some of the most positive young people I have ever been around - and hard working! The hotel at the beginning was pretty mediocre; bus transport was average and everything else was amazing!